With free Wi-Fi and parking a hearty breakfast buffet a daily cocktail reception and an outdoor pool the Cabot Lodge Millsaps offers popular amenities in a convenient location on the campus of Millsaps College and minutes from the Jackson Medical Mall. 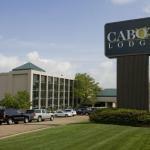 The four-story Cabot Lodge Millsaps offers 173 rooms with flat-panel HDTVs beds with pillowtop mattresses work desks clock radios ironing facilities and coffeemakers plus free Wi-Fi. Wake up with waffles biscuits and gravy meats yogurt and fruit at the hotel's breakfast buffet. Get in a workout in the fitness room then cool off with a dip in the outdoor pool. The hotel hosts an evening cocktail reception and has a guest laundry and a business center. Parking is free. Non-smoking rooms are available. The hotel is located on the campus of Millsaps College across the street from University of Mississippi Medical Center and Mississippi Veterans Memorial Stadium. Access to I-55 is one mile away. The hotel is three miles from Lefleur's Bluff State Park. The Jackson Zoo and the Northpark Mall are 10 minutes away. Jackson State University and the Jackson Amtrak station are two-and-a-half miles away. The hotel is six miles from Jackson-Evers International Airport.